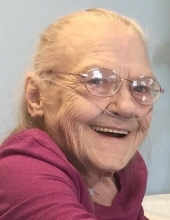 Mary Lorraine Nichols, 77, of South Pekin passed away Friday, August 3, 2018 at Aperion Care in Peoria Heights. She was born October 24, 1940 in Durant, OK to William H. and Ada G. Pyrum Pierot. She married Murl E. Nichols in October 1961 in Sweetwater, TX; he preceded her in death in 1979. Her parents; son, George Nichols; brothers, Rueben Luttrell, Bud Luttrell, Bill Pierot and sister, Margaret Luttrell also preceded her in death. She is survived by her children, Vickie Hoffman, Peggy Cruz, Donald Cooper, Kenneth Nichols, Laura Irvin; thirteen grandchildren; nineteen great-grandchildren and five great-great-grandchildren. Mary worked as a nurses aide for many years; retiring in 1981. She was a caring and giving person and loved helping others. She was an avid reader and loved gardening, playing guitar, writing songs and singing. She also enjoyed feeding and providing houses for all the birds. During the last few months of her life she made many friends with the nursing home and Hospice Compassus staff and fellow patients. In lieu of flowers memorials may be made to Hospice Compassus in her name. Cremation has been accorded and a private service will be held. To send flowers or a remembrance gift to the family of Mary Nichols, please visit our Tribute Store. "Email Address" would like to share the life celebration of Mary Nichols. Click on the "link" to go to share a favorite memory or leave a condolence message for the family.